The shaving cream marbling was disappointing. As I rinsed the fabrics, I could see that the black had basically melted into a blur. Once fully washed, it was evident that the orange was either too close in color to the red (as it was made with the same dye) to be distinguishable, or it washed out completely, the red was actually pretty good, and the black didn’t hold any of it’s definition. This could be user error on my part (maybe the oil used in teh thickener had an adverse effect), or it could be that blacks are really just tricky dyes to work with and the process would have been much more successful had I been using reds, greens and blues. On the other hand, the dye painting went pretty well. The sponged-on black kept it’s shape, and I love my painted red brush strokes. 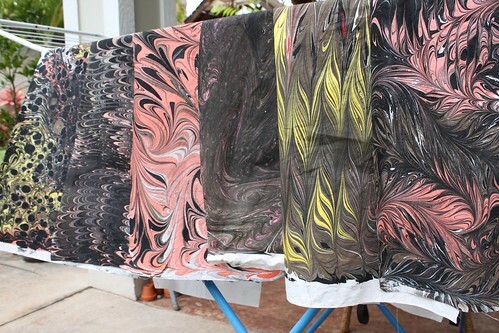 With fussy cutting, I may use some of these for my 12×12 Kilauea project, though I had envisioned a lot more black in the design and was really looking forward to marbled fabrics. Today, I will marble on orange fabric with paint. I feel very good about this since I won’t have to wash it if I don’t want to (the fabric already having a nice base color). I am still up for trying the marbling with dyes again, but I am out of black and don’t feel like driving to town to go buy more nor am I ready to place an order online given the time left for this project and the guests arriving next week. Some day, I will try making a concentrated dye solution with Procion powders and urea water, which I will float on carageenan size and transfer onto fabric soaked in soda ash and water. But not today. 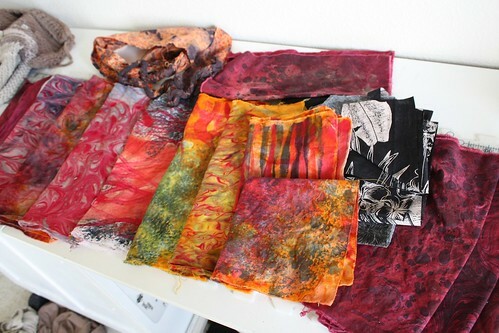 I have marbled with paint which gives great control, and I have dyed with fiber reactive dyes which give good color and hand, so now I was keen to see if I could combine the best of both worlds and try marbling with fiber reactive dyes. I started out writing this post with all the recipes and directions thinking that someone might want try to do this too. But by the time I reached the rinse out stage at the end of the day it was clear that all I produced was a big bucket of fail. I put my resources and recipes at the end though in case anyone wants to avoid my mistakes. In preparation for my marbling experiment, I mixed up a batch of carageenan size on which to float the dyes, just as I would have for regular paints. 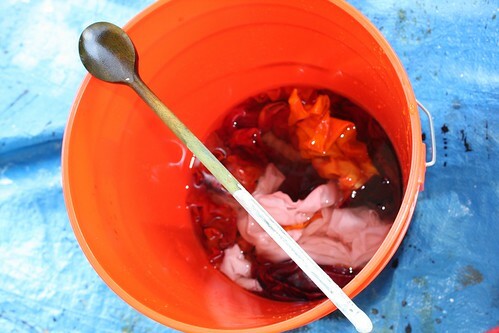 I made thickened dye paints using information gleaned from the internet. I used two recipes for comparison. One pretty standard, one with a little oil used to keep the thickener from clumping (which I thought might also help with that whole floating on water thing one needs with marbling). The dye paints are a mixture of dissolved Procion dye powder, Print Paste, and water mixed with urea. I dripped a few of these on to my carageenan water and they seemed thick, so I let it all sit overnight with the plan to thin the paints with more urea water in the morning. On marbling day, I soaked my fabrics in a solution of water and fixative, then hung them to dry. 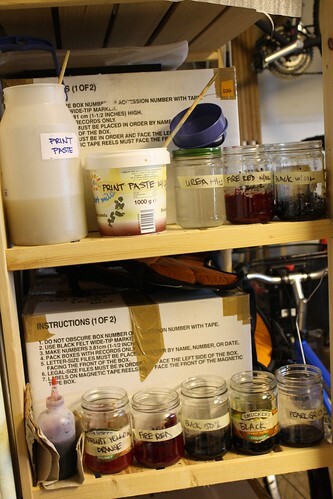 To start, I thinned my basic dye paints with a little urea water. They sunk. I increased the urea water, but the paints still sunk. I tried the dye paints with oil and had more floating and less sinking the first time, but the colors were blotchy due to the oil. 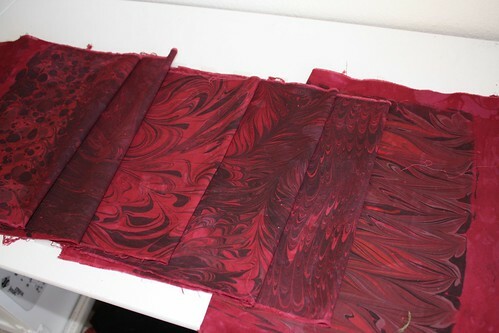 At this point, I laid a piece of fabric on top to see if the dyes would even transfer and to my delight, they did! 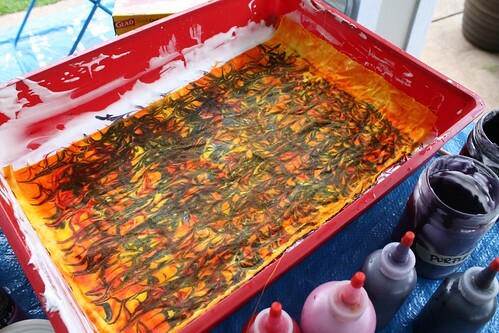 Unfortunately, when I switched to marbling with the dye paints with oil, they all decided to sink just like those without. Looking back, I see in my Dharma catalog a wetting agent called calsolene oil. I wonder if I could float concentrated (but unthickened dye with calsolene oil on my carageenan size. Hmmmm……. I vaguely remembered seeing instructions for dye marbling with shaving cream that recommended leaving the fabric a few minutes before removing it from the size, so I kept that in mind when I was testing my fabrics. However, after less than a minute the fabrics started to sink so I had to take them out. After sitting on the sidelines about 10 minutes, even the faint pattern they had disappeared. So, after all my variations of thinning and oiling failed, I thought I might as well just go ahead and try the shaving cream method. I went back to my undiluted dye paint (the batch with oil since I wanted to save the standard batch to paint with directly in case of complete catastrophe) and added shaving cream to it thinking that this wasn’t too far from the formula on the Dharma instructions. Certainly this technique is easy — especially if one doesn’t go through the exercise of making up the now unnecessary print paste the night before. The carageenan size was a complete loss, though I did contemplate saving it to use with paint. I decided I’d rather just make a fresh batch if it came to that. Marbling using the shaving cream technique went pretty smoothly and the results batched in the sun under wraps for a good five hours. I really hoped the colors would be as vivid when done as they looked while wet. Washout does not look promising though. 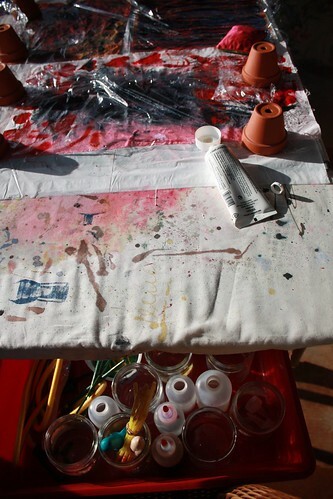 Because I had taken the trouble to make up the dye paints, I decided to do some painting directly on the fabric. Painting went pretty well, so I handed over the operation to the Jr. Redhead. About half way through her painting the table tipped and everything came crashing down around her. We saved the red paint, and she emerged unscathed and undyed except for some black splodges on her hands. I cleaned everything up while she shakily painted a few red hearts on her fabric. The reason people marble with paint is because it works. Perhaps I need to experiment not on dye versus paint, but on better fixing my paint with more time under the iron or in the dryer. 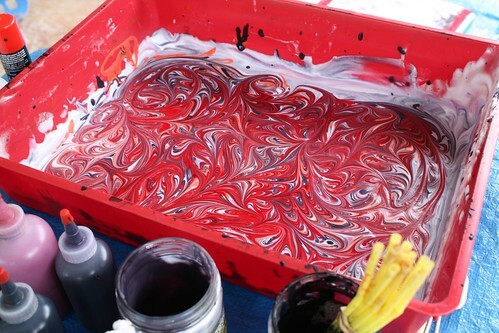 Marbling on shaving cream is fun and easy to do. I’ve seen pretty nice, if grainy, results online, but my attempts look like the black is a complete blur. I have high hopes for the pieces we painted on directly, but they have no marbling, which was the whole point. Now I have to decide whether I want to return to traditional marbling with paint tomorrow, or order new supplies and try unthickened dyes, perhaps with calsolene oil. If I have to order though, I may be cutting my time too short for the 12×12 deadline. DISCLAIMER: I am not a frequent nor expert dyer. The following is merely an experiment put to digital paper as reference mainly for myself. It is an accumulation of advice from many places such as a dying class taken from Dijanne Cevaal, fabric marbling with the book “The Ultimate Marbling Handbook” by Diane Maurer-Mathison as guide, and online resources such as Prochem and Dharma Trading Company. My base or size on which to try floating the dyes is a mix of 3 Tablespoons of carageenan to each gallon of water. I mixed enough, with my immersion blender, to have at least 2 inches of size in my designated tray. I use this when I marble with airbrush paints. It is mixed up the night before so it could properly thicken and the air bubbles could subside. In a perfect world I’d use distilled water, but I am too lazy to go buy special water for a project. First, I mixed urea and water: 1 cup warm water to 7 teaspoons urea. For the print paste, I mixed 3 cups warm water, 6.5 Tablespoons urea and 8 teaspoons sodium alginate thickener. I mixed this all up and allowed it to “rest” for several hours. I also made a batch in which I added 1 Tablespoon canola oil to the sodium alginate to minimize clumping. This was intriguing because since oil and water don’t mix, I thought it might be helpful for floating the colors on the carageenan water base. Other results notwithstanding, adding the oil definitely helped decrease clumping. Many recipes also suggested adding water softener to the print paste. I did not have any, so I skipped this step. It may be something I regret. To make the dye paint itself I dissolved my Procion dye powder into just enough of the urea water to make a paste. I used 1 tsp powder for the red, pearl gray, and light black (which due to powder formulation should be a different grey than the pearl grey). I used 1 tsp yellow and 1/2 tsp red to make orange, and I used 4 tsp black since all sources said black needs more. To the blacks, I also added a teaspoon or so of table salt. I did not see reference to salt online in conjunction with dye paints or marbling, but in my class with Dijanne we used quite a bit in immersion dying and my new Dharma catalog had a small reference to use salt with blacks in tie dying so I did. Then I added a generous glug of print paste to each jar, duplicating some of the colors but using the print paste with oil just for comparison. I topped off each potion with enough urea water to make 1/2 cup of dye paint. Yesterday I discharged. I used Jaquard Discharge Paste, which works nearly as well as bleach on hand dyed fabrics and is a bit less toxic. 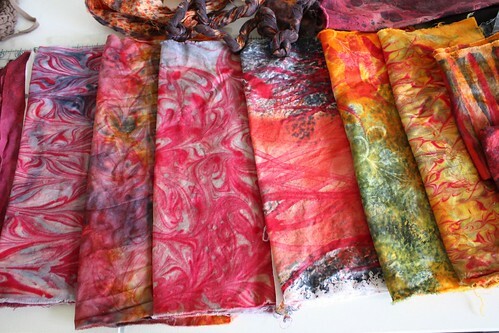 I slopped it around on some of the dyed marbled fabrics I was dissatisfied with a week or two ago. It definitely lightened things up, but the results look more worn and scuffed to me than hot and molten. I think this photo shows better how the black paint has faded than the pre-discharge photos do. What it also shows is a few pieces of very hot orange fabric from my quilt mom Gerrie, which I think are great candidates for more marbling. I also have an interesting piece of orange flowered fabric from blog friend Mary that’s been twisted and dyed black, which has some lava potential as well. This has been a great experiment. I may use a few tiny bits of these fabrics, but I am inspired to keep trying other things until I get the finished result I want. I’m pretty sure that marbling on orange will get me the colors I envision, but I’m not wild about how the marbling paint behaves after washing. 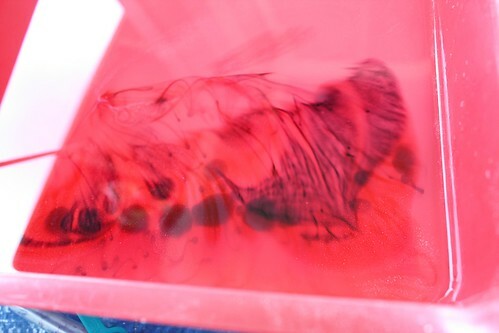 I’m going to try marbling with fiber reactive dyes next. I’ve queried the dye and marbling source, Dharma Trading Company and though they had no formulas for me, they did think I was on the right track. On the more successful side, I discharged some roots for another project. Since discharging on hand dyed fabrics can produce unexpected and wonderful colors, I tried three different fabrics just to see what happened. The top fabric is a cotton duvet cover that I had previously tie dyed turquoise and then a reddish brown. I over-dyed it with a green mixed from blue and yellow dyes I had. The center piece is an ochre/brown commercial print over-dyed with the same green as the piece above. I was kind of hoping that the discharge paste would only go through the dye and reveal the commercial print, but I got the same turquoise as above. The bottom piece is a linen tablecloth I had previously dyed reddish brown and baby poop color. I over-dyed it a darker green made with a different yellow, the blue and some black and leftover mystery dye (I know, very scientific). I quite like the tie dyed shapes on this one and the roots discharged to a nicely contrasty turquoise that intrigues me. But I’m thinking I’m going to use this one because of the loamy, earthy, colors and texture. Our vacation to Arizona was primarily to visit with my sister and her family. 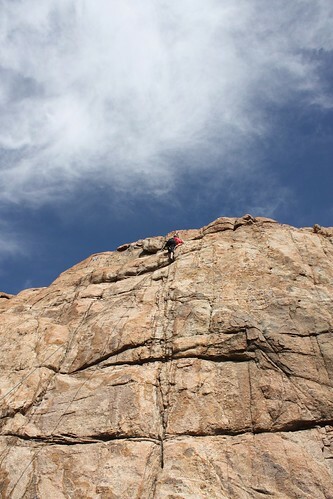 They are avid rock climbers so of course we had to go climbing while there. Since their kids are small and mine had never climbed before, we planned on canoeing too, in case anyone preferred paddling. Snowfall was heavy this year, so our destination, Watson Lake, was pretty full. 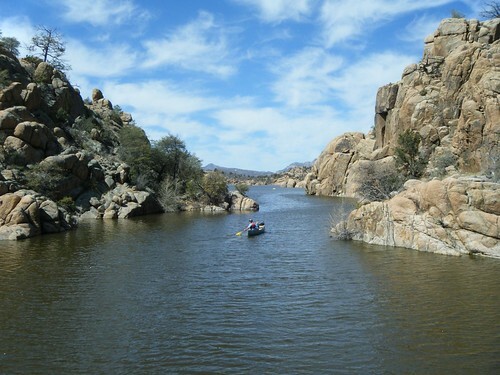 The usual path to the climbing area was under water, so instead of bouldering with gear, we opted to canoe to the site. After dropping the climbers off, my brother in law also shuttled my man to a trailhead so he could go running through The Dells and their cool rock formations. That was about the extent of the canoe use though because my kids loved the climbing! 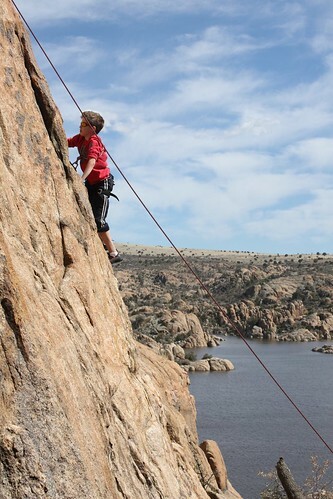 The boy scrambled up the rock face like a natural. He had the advantage of borrowed climbing shoes, but I suspect he would have done well in clunky boots too. My girl, in her rainbow tennies and less aggressive attitude, took a few attempts. She got it though and made it to the top on the third try. 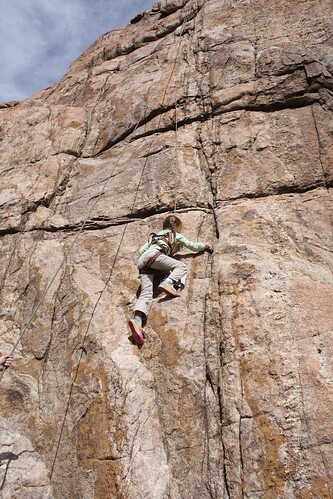 I was the proud mom on belay (the one on the other end of the safety rope). The kids almost made it look easy. The view was great, and the kids were chuffed. When my kids are asked how they like living in Hawai’i, they usually say something like “It’s OK, but I miss snow.” They grew up in Germany where all four seasons march through the year like good little soldiers in nearly perfect three month increments and with all the hallmarks of a classroom chart. So, when we went to Arizona for their spring recess they requested enough snow to make snowballs and maybe even toboggan a little. Lucky us, one of the mountain backdrops to my sister’s house had just enough snow to fit the bill. Brace yourselves for more vacation pictures to come! In theory, overdying the marbled fabric worked great. In practice though, I should have had a few colors of dye. This red is too bloody for what I had in mind. A clever girl would have dyed two pieces in the dark red, two in bright red, and two in orange. Or maybe, started with orange, and if it didn’t work, gone progressively darker. Of course, I’ve never been much of a tester when it comes to this kind of thing. I do tend to throw caution to the wind. Sometimes it works, and sometimes I fall flat on my face. On teh other hand, I overdyed a commercial fabric and two other hand dyes with a dark peaty green at the same time and they turned out just how I had hoped they would. I have discharge plans for those, and now at Gerrie’s oh so wise suggestion, I’ll try discharging these too. Well, maybe I’ll start with just one! I made this as a gift for a pair of tween sisters who’s mom just redid their shared bedroom in turquoise and white with a healthy girl dose of pink and chocolate brown. Well, maybe not JUST did their room — it has taken me over six months to finish this quilt and the room was nearly done when I started. Not being a priority quilt, it kept getting pushed aside, even though I thoroughly loved working on it when I did get a chance. I ran out of thread a few times too, and that slowed me down as well. I also like the back — though white would get too dirty too fast in my house. But I figure if it’s OK on a back because no one needs to see the back. 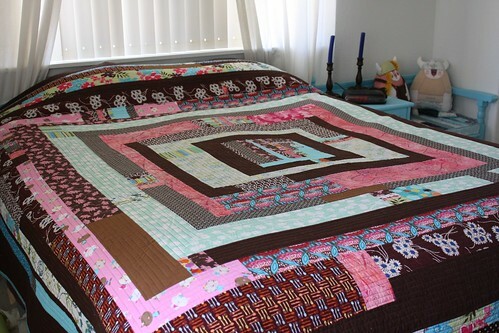 I tried to stick to fabrics in my stash (like the duvet covers that make up the white backing), but it was way too much fun finding pink fabrics with brown kitties, and the brown and white circles, and the pink and brown…. I confess I bought a few new fabrics for this just because I couldn’t resist. I used them all up though. The Girl Quilt was inspired by this quilt by Lucy T. Pettway of Gee’s Bend (center). There’s quite a bit of Denyse Schmidt (far right card) influence as well in the center medallion and the back. 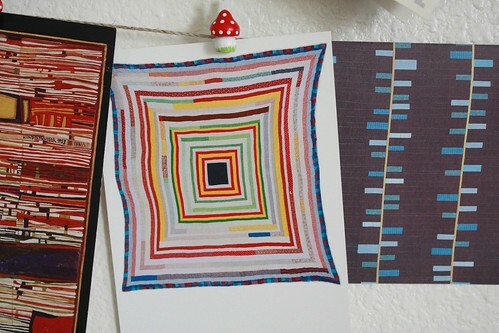 I keep a pin board and sketchbook of things that catch my eye, and lots of scribbled notes. I never know exactly when or how they will show up in my work, but they are very important. I occasionally look back on older sketchbooks and still find informative things waiting in them. 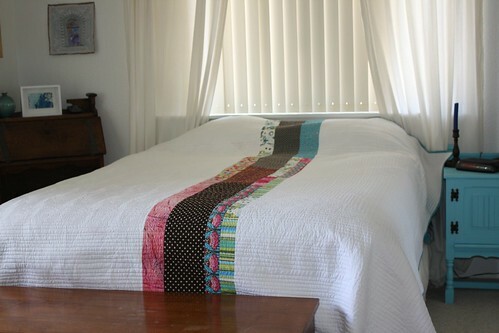 Now I need to find the time to deliver the quilt. The girls live on Kauai and their mom is a long time family friend so I’m pretty sure we need to take this in person — because who wouldn’t want to spend a long weekend on a Hawaiian isle with friends? On Saturday I gave a workshop for the quilt guild on marbling fabric. I’m no expert, but I’ve done it a few times for myself and for other quilty friends, so i figured “why not?” The guild was hosting a retreat at a “camp,” so we had a cafeteria, a large lanai, and all day in which to work. Great conditions. 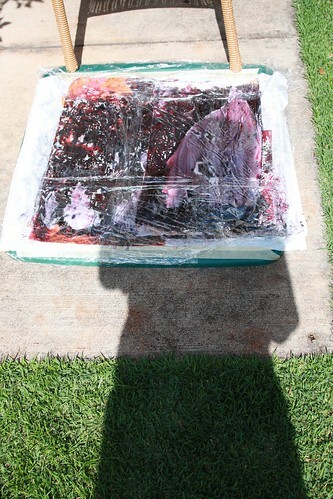 I pre-prepared 20 yards of fabric, about 15 colors of paint, and 9 gallons of “goo” on which to float the paint. That was a lot of stuff to carry with me, but a few 5-gallon buckets did he trick. Four trays to work in was just about right for the 14 students we had. There was just the right amount of waiting and watching each other (good for inspiration) without feeling like you were standing around bored. Though, with six pieces of fabric each to marble, we exhausted the goo in a few hours. Unless one has a very light hand and paints that float perfectly, there can be a lot that sinks to the bottom. As the goo is depleted with each “print,” you can dredge up more and more sunken paint. I made 6 more gallons of goo at our lunch break which kept everyone going until we had used up our fabric, but if I were to do another workshop I’d mix two rounds worth of goo beforehand or limit the class size or number of prints each person could make. Six opportunities each is good though because there were lots of chances to try different patterns and color combos. Unfortunately, I did not remember to bring my camera to the workshop. It’s too bad too because we had a great time and color was flying everywhere! We had a great group of ladies who were willing to “go with the flow,” and just play. I took home the leftovers and did a little more marbling this morning. I realized that marbling could be just the right technique for the 12×12 theme I came up with: Kilauea. My results above are not as deep and rich in color as I wanted so I’m going to try some over dyeing with Procion dyes this week. We’ll see what happens.